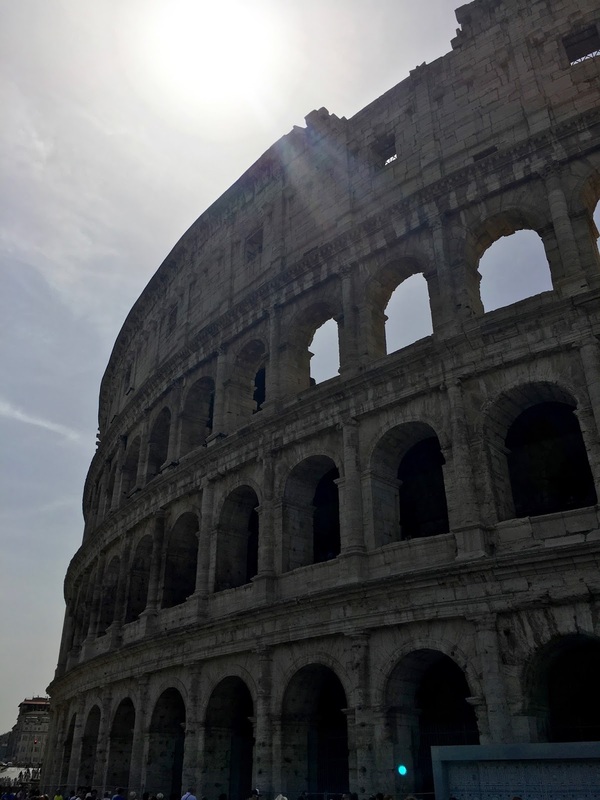 Our next stop on our Mediterranean cruise was Rome. Rome was amazing. I mean, amazing. The historical significance of this city to Western culture cannot be over-emphasized, and our single day in the city was just a big ole tease. We're already planning to return to Italy in two years to see more of the city, as well as do some day trips outside Rome. Our first stop was the Colosseum. Because we were in the city on a Saturday, the place was mobbed, and we didn't have time to stand in line to go inside. So we admired it from the outside, and made plans to visit first thing in the morning, on a weekday, on our next visit. Each day the gushing torrents of the Trevi Fountain are silenced for one hour while city workers sweep the coins from the fountain. Since 2006, the Roman Catholic charity Caritas has been sorting and cleaning the daily loot from the fountain. Caritas runs food and social programs for the needy and oppressed in 200 countries and territories worldwide. 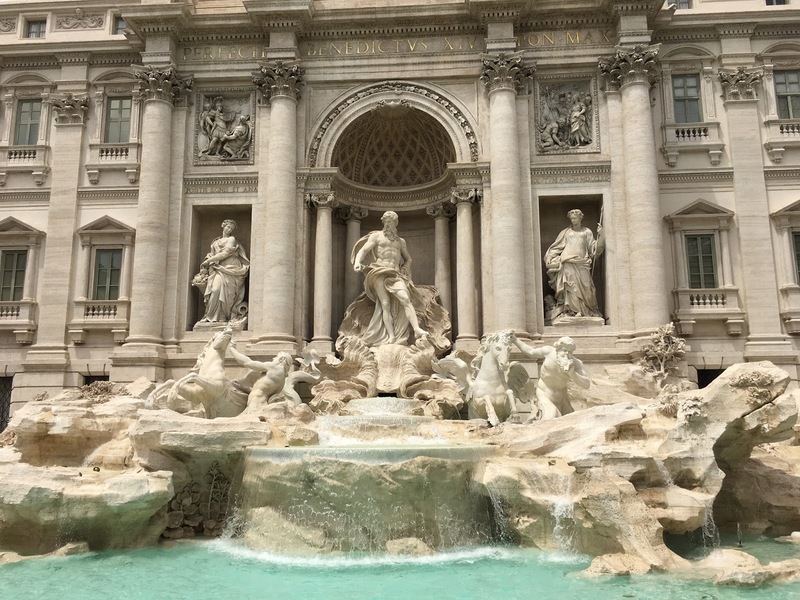 Somewhere around €3000 is collected nightly from the Trevi Fountain (about $1.26 million annually) and distributes it amongst the needy. Caritas even opened a low-cost supermarket in Rome in 2008 for the needy. 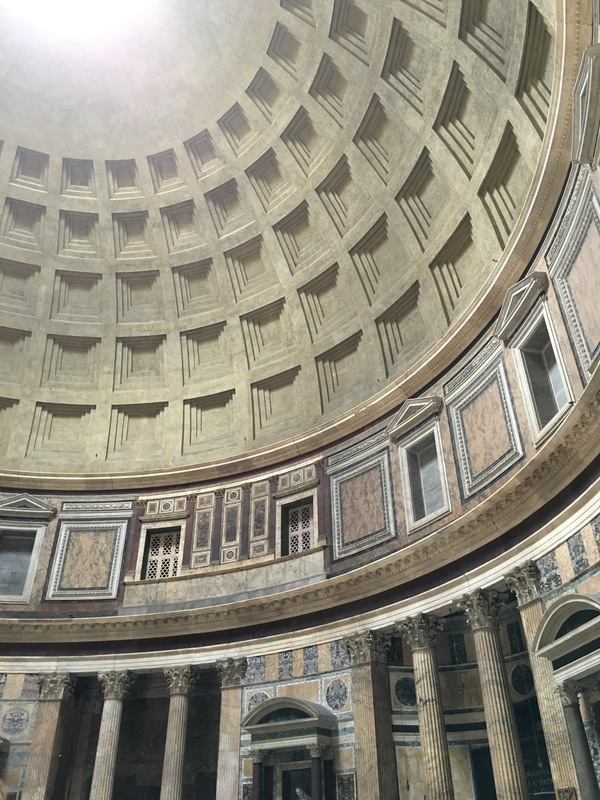 Perhaps the most amazing sight we saw on our day in Rome was the Pantheon. Dedicated about 126 A.D., it has been in continuous use since that time. Originally a "Temple to every God," it's been dedicated to St Mary and the Martyrs since the 7th Century. What made this so amazing was the fact that it's still standing, is still the world's largest unreinforced concrete dome, and it's still amazingly beautiful. The view from the floor to the occulus. I haven't yet mentioned the food in Italy. It was AMAZING. I'm not a big fan of Americanized Italian food, as I have a mild aversion to red sauce. But the food in Italy wasn't that. I can't wait to go back and EAT ALL THE FOODZ. I took my granddaughter to Rome for a couple of weeks last year. We stayed in an AirBnB apartment south of the city centre but on the Metro line. It was cheap (everything in the tourist areas costs twice as much), gave us access to everything and allowed us to see how most of the people lived. I highly recommend it. We stayed at A casa di Pino a San Giovanni.